Sign up here to be the first Soldier of the Month for 2018! 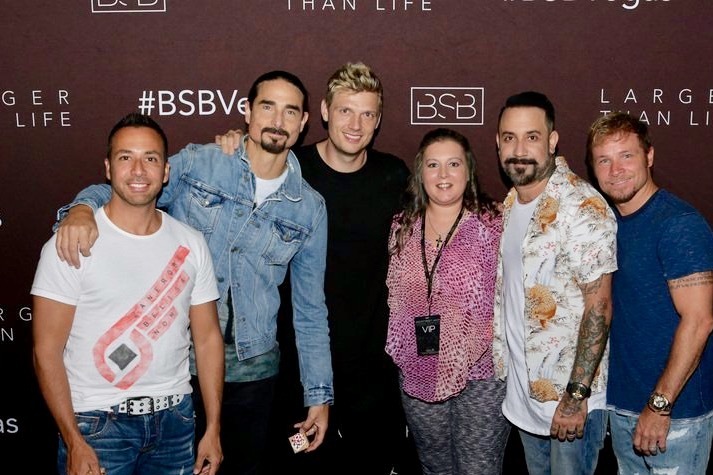 If Backstreet Boys fan club member Christina Schindler could get her best BSB friend Rachel would thing for Christmas, it would be to do a show together – specifically the last show in Vegas. Unfortunately, because of their schedules, it’s been hard for them to get together to see the band live. Christina and Rachel and met in middle school, talking about the Backstreet Boys and trading photos of them. They became known as Frick and Frack and everybody in school and even now as adults, call them that. But don’t let the nickname fool you – they aren’t Nick and Brian girls. They are actually AJ girls. What do you do for a living? I own a cleaning company and I’m a professional Backstreet Boy fan! Tell us a little bit about yourself: I’m 32 years young. I moved to Florida a few years ago and have since moved back to Indiana due to health issues. I have been an avid fan since I was less than 12 years old. I’ve met the guys a handful of times over the years. When anyone sees my Camaro, they know I’m blasting some BSB for all to hear! How did you become a fan? I heard them on the radio on a Christmas Eve and I was hooked! What is your favorite BSB song and why? “One In A Million” because in my darkest days I would listen to this song and instantly feel better. What is your favorite BSB video and why? “Shape Of My Heart” because it’s just so good that you can’t help but love it! That and I remember the hard times the guys were going through during that time and they prevailed. Who is your favorite Backstreet Boy and why? AJ because I was always into his bad boy style and tattoos and raspy voice. How has BSB impacted your life? For 10 years now I have struggled with addiction/alcoholism. The guys have always been able to help me cope with daily struggles in a healthy way. They have given me a reason to live and to know what unconditional love really means. What is your favorite thing about being a BSB fan? Being able to spread and share their music and love! Have you been to Vegas? If so, how many times and if not, are you planning on seeing a show? I went on June 16th of this year and went VIP solo. I am hoping to be able to go again if I can.